First of all, let me tell you honestly, Fitbit Versa is not a Fitness band that is only concerned with Fitness related modules, it’s a smartwatch, probably one of the best smartwatches with a wide range of features at the minimum possible rate. 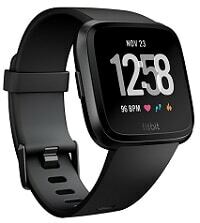 That’s what each one of us is expecting today, to save money, why not to make a smart decision by choosing Fitbit Versa if you are making up your mind to buy Apple Smartwatch Series 4. But, before going further, Let’s have a look at the Fitbit Versa enormous features. Versa is technically designed to provide maximum range of facilities at a low price, for more information you can read “Apple smartwatch series 4 Vs Fitbit Versa” for further assistance, you can make the most of it by installing Versa Apps for free. All you need is to have a piece of proper knowledge about how to use these amazing features. You can get the following features in one box. We have a detailed list of possible questions to cover up the Swimming Manual with Answers, you can read out without wasting your precious time. We hope it would help you a lot in a better way. People ask the same question “Is Fitbit Versa Waterproof?” and the answer is simple, “Yes, Fitbit Versa is water resistant up to 50 meters“. You don’t have to switch to any other mode, just jump into the water and enjoy. Few customers have a complaint after being in the water, therefore, you are supposed to check the watch first if it is still within the warranty date. You can send back to the manufacturer. Does Warranty come with the Fitbit Versa? Yes, you can have a 1-year warranty with the Fitbit Versa. If you have any issue regarding water resistance, you can get a claim as early as possible. How can we Set the Pool Length? Before you start your swim, please enter the pool length in meters or yards as a default length until you change it. If you are swimming in another pool you have to change it accordingly. Tap “Account Icon” from Dashboard. Which stroke can you use to swim? Most recommended swimming style is Freestyle but you can also swim other three ways like backstroke, breaststroke, and butterfly. You can go under the water up to 50 meters, though it can be used for scuba diving but try not to go deeper than 160 feet because it is not technically designed to resist so much pressure, however you can use it while taking your shower and swimming in a pool. It is highly recommended that you must not choose a leather band if you have a plan to use it for swimming, leather will slowly dry out and it’ll start to degrade. The best option is to use silicone followed by woven nylon because it dries off easily. Why not to choose Kmastic Fitbit Versa Soft Silicone Sportsband made up of premium silicone material, it is probably the best option for athletes and swimmers.